Ten, nine, eight, seven, six: the countdown’s begun to your New Year’s Eve party! I’m sure you’ve got some games, some champagne for toasting, and the best noisemakers available at checkout shelves. 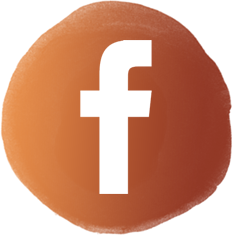 Have you thought about party favors? You are hosting a party, right? How about a few shimmery wands? 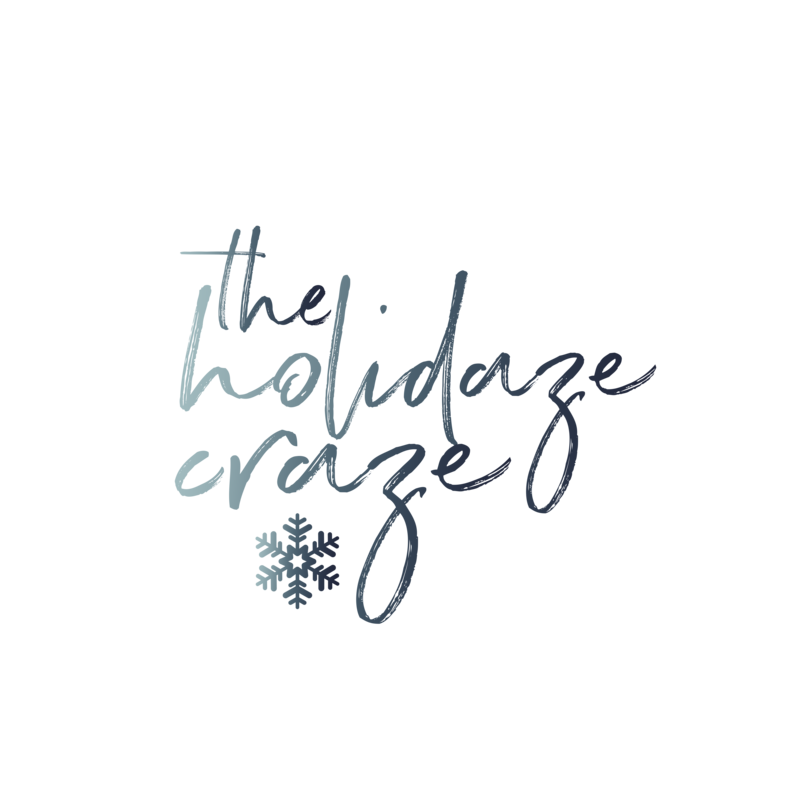 Get some cardstock, ornaments, ribbon, hot glue, and dowels. Then you can print out Soho Sonnet‘s pattern for some happy text, or write up your own. 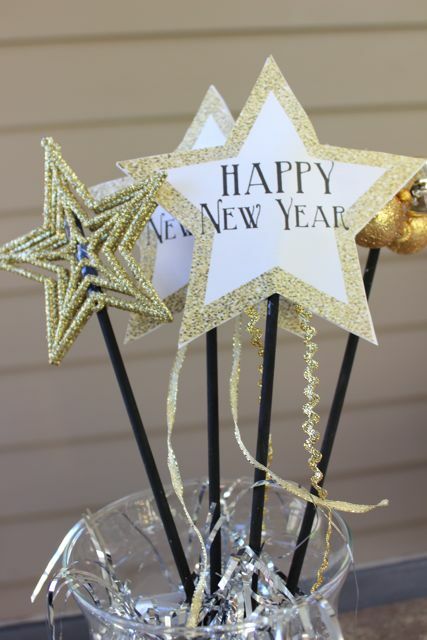 These are a perfect accessory for pictures at your New Year’s Eve party. 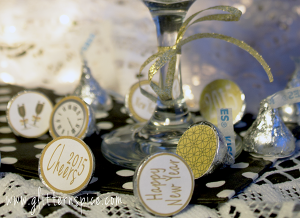 These favors are meant to be used at the party -during the countdown, in fact. Did you notice the descending numbers? 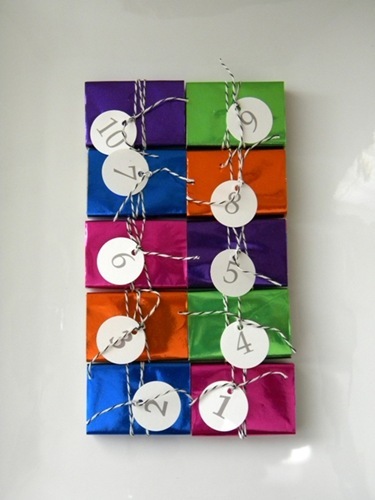 Each temptingly-wrapped present hides a bunch of confetti, to be released when that number is called. Watching the New York ball drop will be more engaging, and way more messy. 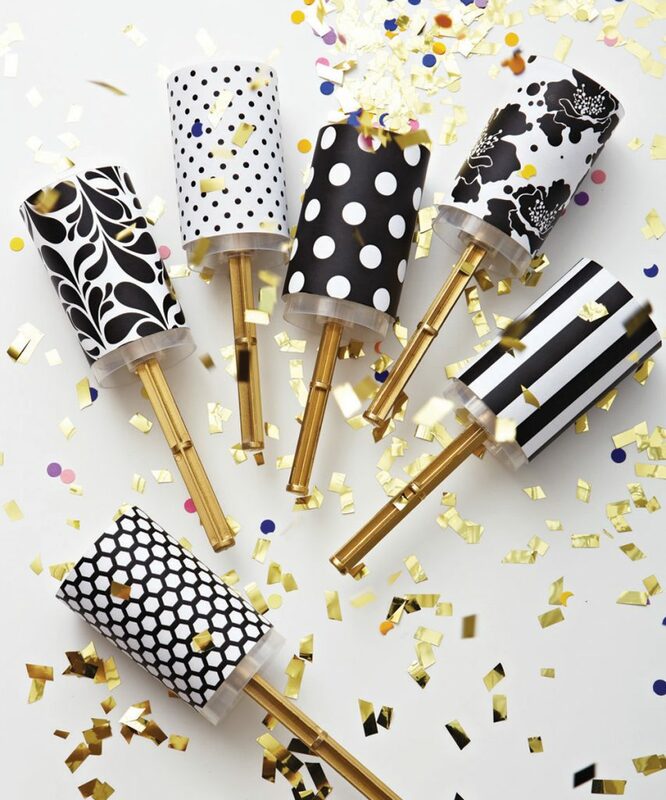 These are a definite must have for your New Year’s Eve party. Perhaps you’ve heard what happens at midnight? Here’s a hint: it involves kissing. As such, why not gift up a few Hershey’s Midnight Kisses? Glitter ‘N Spice has some cute labels you can print and attach. After sticking a bunch into decorative bags as favors, blow a few kisses around your buffet as decoration. 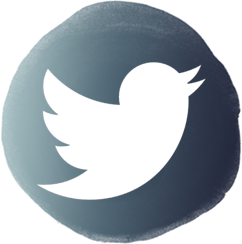 Feeling like cobbling together something more special? 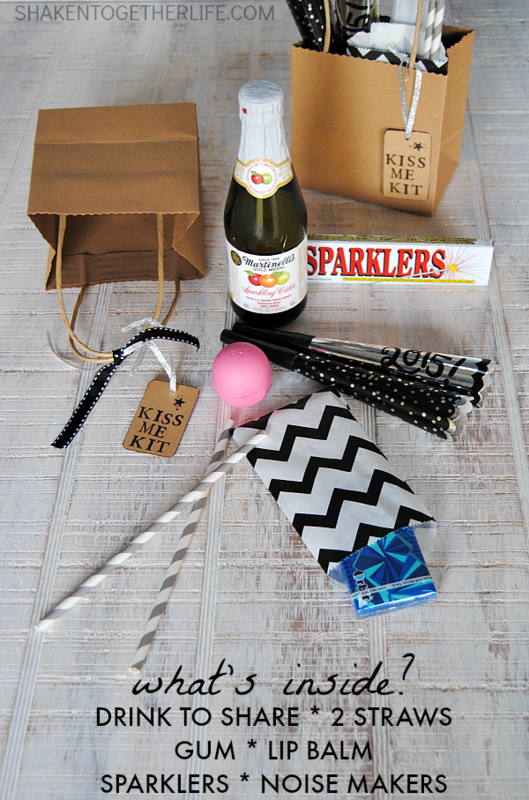 I’m with you, with this Kiss Me Kit from Shaken Together. Grab some cute bags and tags, plus a tissue sleeve. 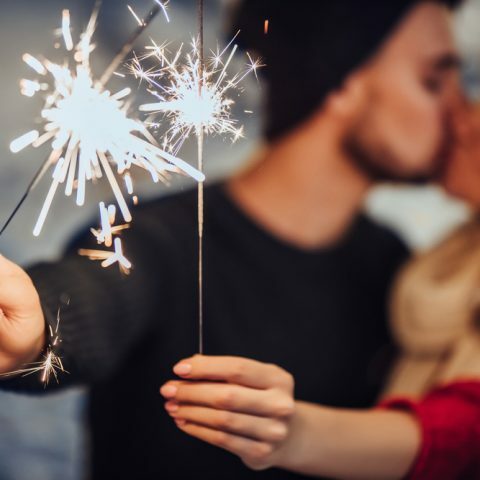 Stuff them full of a miniature champagne or sparkling cider, two straws (wink, wink), two noisemakers, sparklers, lip balm, and freshening gum or mints. Who wants to go in for a kiss unprepared? 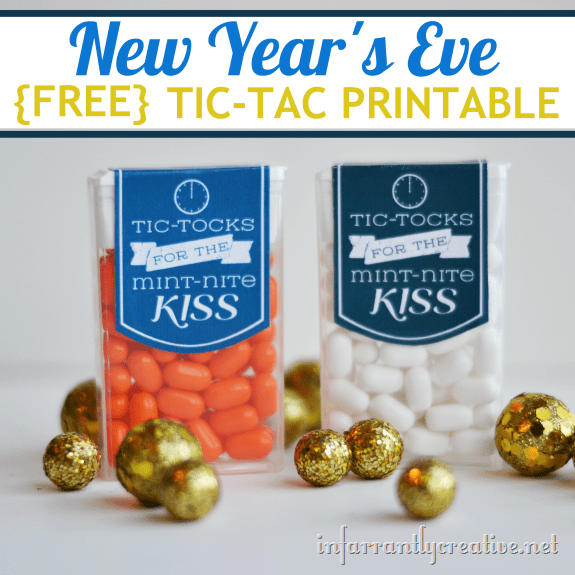 On that subject, Tic Tocks -I mean- Tic-Tacs are another great party favor idea. 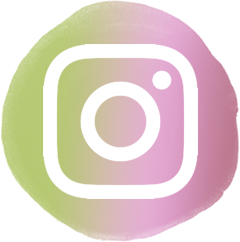 Print out the cute tag from Infarrantly Creative and paste it on a few flavor varieties. You can gift one to each person, or throw them in the Kiss Me Kits from before. Buy Tic Tacs in bulk here. 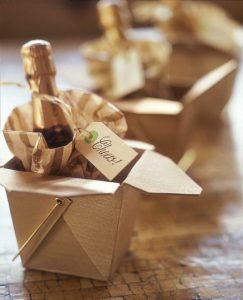 I’m really sold on the miniature champagne idea, mostly because I love small versions of things. I know your guests will love them too, especially if they’re wrapped up all fancy like these from Williams Sonoma. 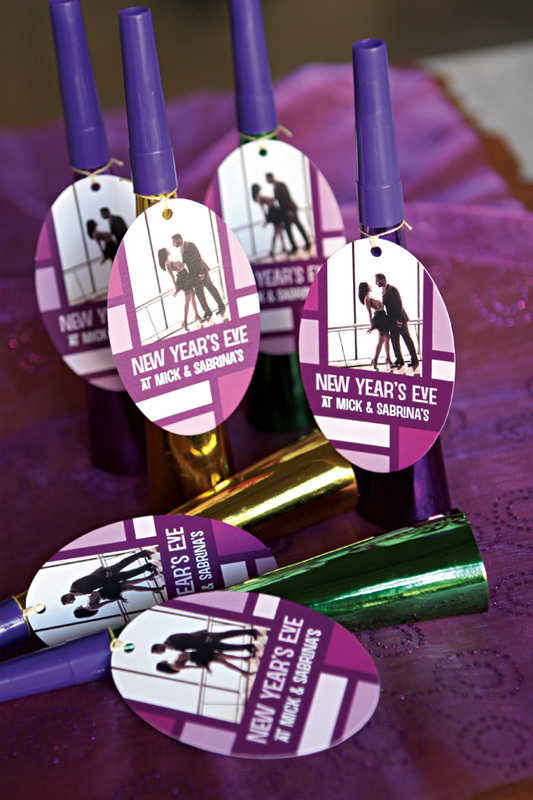 Most of the ideas I found for favors come from the sorts of things you use at New Year’s Eve, like noisemakers. Just pop a tag onto a few you bought at the party store. Or, craft your own and then slip a tag on. Don’t forget about confetti, the messiest fun a party animal could have (hopefully). These stylish tubes at Wedding Bells began life as push pop containers. Apparently, it’s a craft item you can buy. 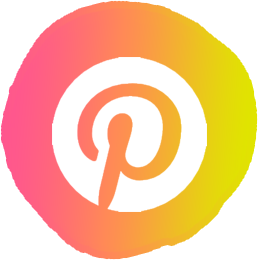 A little spray paint and patterned paper later, and you’ve got the cutest handout for guests!